Do you ever visit someone else’s home and fight the jealousy that swells within you? You love what your friend has done with their recent kitchen remodel but think that such an extravagant change would be outside of your budget or realm of possibility. However, most of our customers are amazed at just how doable a beautiful kitchen makeover can be and how just a few slabs of natural stone material can completely revitalize their entire home. After all, the kitchen is often the busiest of rooms and the one which often sets the tone of design for your overall living space, so why not be surrounded daily by something that you love! 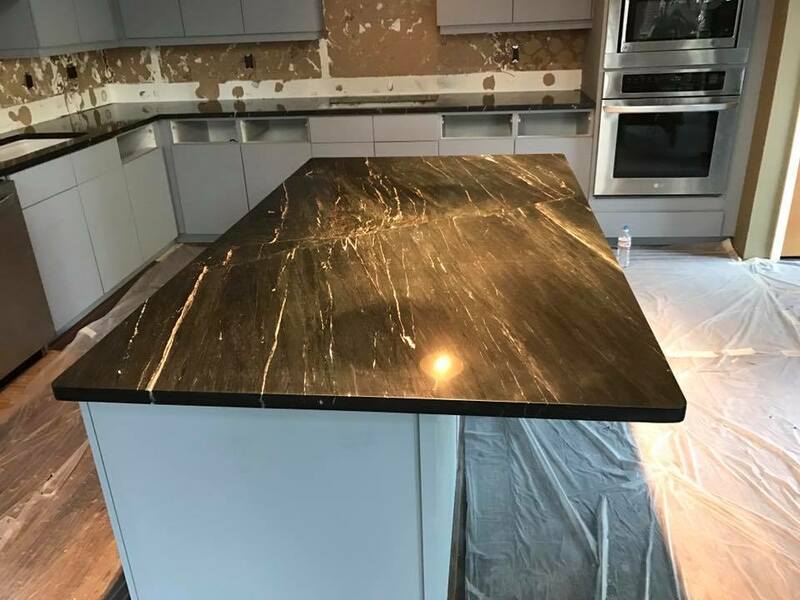 We have found that adding black marble countertops to our residential projects brings a touch of luxury and sleek elegance that many of our customers seek. They want a kitchen that looks clean and classy, one in which feels like home on a daily basis yet also serves well as a showpiece for dinner parties and family gatherings. Black marble is the perfect solution to the family who needs space to spread out and get messy. Whether making a meal, prepping snacks for the week or working on a current science fair project, the kitchen counters in our homes see all kinds of messes and hazardous substances, and marble is known to be a durable material that can stand up to the test of time and the wear and tear that messes can bring. Each of our customers begins the design process with a project manager who is well-equipped to listen and learn about your specific desires and needs in a workable kitchen space while offering helpful suggestions along the way. Together we will draft a design that is the perfect fit for your home and then utilize our talented fabrication and installation technicians to finish out the job. We carefully treat every customer’s home as though it were our own and settle for nothing less than the very best work. Call us today to learn more about our stone expertise and to give us the pleasure of getting started on your new marble project!